In Shamanism, Archaic Techniques of Ecstasy, Princeton University Press 1972, Mircea Eliade writes: A first definition of this complex phenomenon, and perhaps the least hazardous, will be: shamanism = 'technique of religious ecstasy'. Shamans, Masters of Ecstasy. by David Stern, Photograph by Carolyn Drake. 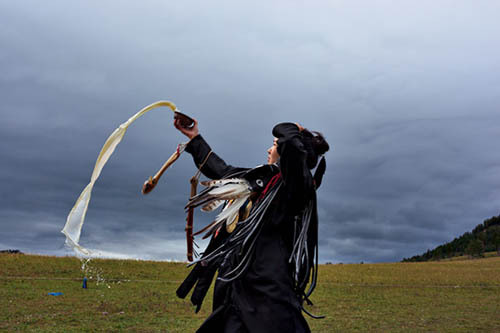 This article, from National Geographic, provides an opportunity to observe a modern Mongolian shaman. Along with a vivid description of the event observed, Stern says this: "The word “shaman” comes from the Evenki, a Siberian people, but shamans can be found in practically every corner of the planet—including in shamanic centers now in London, Boston, and many other Western cities. Shamans believe that unseen spirits permeate the world around us, act upon us, and govern our fates. By turns doctors, priests, mystics, psychologists, village elders, oracles, and poets, they are the designated negotiators with this hidden reality, and they occupy an exalted position within their societies." Read the article. Psychologist Anthony Bossis: Can psychedelic drugs help ease the fear of death? Without actually calling it shamanism (but with reference to ancient mystics and their use of 'sacraments') psychologist Anthony Bossis talks with Mary Hynes on CBC's Tapestry program, March 12, 2015. Listen to the interview to get a taste of what that shamanistic experience might be like. The New Yorker Magazine also ran an article about this. Annals of Medicine | February 9, 2015 issue. The Trip Treatment: Research into psychedelics, shut down for decades, is now yielding exciting results. By Michael Pollan. "Psilocybin may be useful in treating anxiety, addiction and depression, and in studying the neurobiology of mysical experience." Read the article.